It was a busy day at REGI today. It was suppose to be even busier with 21 veterinary students from UW-Madison coming to volunteering, but the weather took a nasty turn. We worried about their traveling today. They will come in the spring. 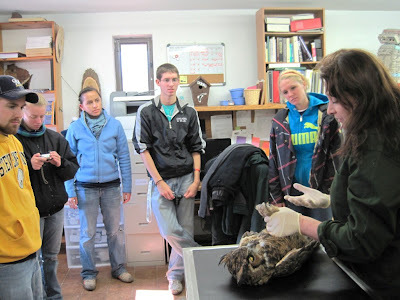 The Pre-Vet Club from UWSP did not have so far to drive. They took the chance and came on over. Preparing for winter is a big deal around here. 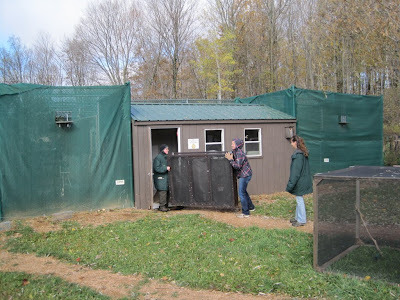 We have to be certain that the birds in our care are protected from those north winds that can whip last year to a documented 72 degrees F. below zero. Winter has been seriously threatening so we haven't a moment to spare. After working hard all morning we enjoyed bowls of chili and hot chocolate to warm up. After that it was time for the students to get some handling experience with the raptors. This training is good for everyone. 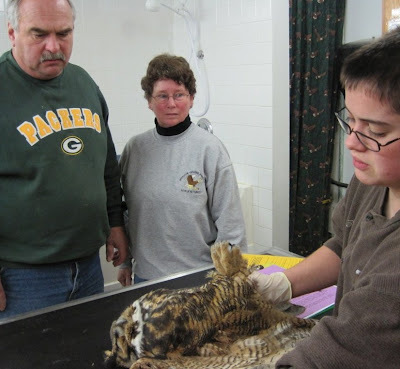 From our perspective we have more students that can help with wildlife rescues in the Stevens Point area and even better students that may be thinking about a career in wildlife medicine for their future. We will be elated to say " we knew them when". Later this evening we admitted a beautiful young female Great-horned Owl that had been shot. She was lucky to have been found by caring people that called and brought her to REGI as soon as they could. The owl weighs only 2 lbs which is well under her normal weight. She is anemic and was dehydrated as well. She was stabilized and put in a heated box for the night. Tomorrow we will have a better idea as to her prognosis. 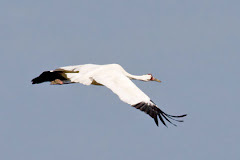 Shooting is illegal for these state and federally protected birds but it seems there are those out there that either don't understand that or don't care. It is a sad statement for our society. Nicole Swanson, our Director of Education, got back from the conference she attended much of this week in Eau Claire. She brought back lots of great ideas and renewed enthusiasm from the conference. It is so good to network with people and in doing so trade ideas. Nicole did a presentation at the conference and will do a blog entry next week to tell us all about it. Busy lady, she did a program tonight in Wausau as well. Off for tonight. Morning comes early and it is going to be another busy one.